Such numbers are more commonly associated with left-leaning critics of the deal, not the federal government. In 2016, for instance, the U.S. International Trade Commission issued an extensive review of literature and simply noted a wide range of estimated impacts, depending on the political perspective or type of research. The report soberly referenced studies that showed the “mixed and nuanced nature of NAFTA’s estimated impacts on aggregate employment” without concluding there was a definitive estimate. NAFTA took effect on Jan. 1, 1994, nearly 24 years ago. So, on the face of it, 700,000 jobs over a quarter-century does not seem like much. That’s about 30,000 jobs a year, which is a drop in the bucket of an economy with nearly 130 million full-time jobs. Just between 2009 and 2011, 6 million workers were displaced from jobs they held for more than three years, largely because factories moved away or closed, according to Bureau of Labor Statistics estimates. So Lighthizer is touting a number that is minuscule in absolute terms and negligible in percentage terms. It turns out this is a rather outdated number. An official at the trade representative’s office said the number reflected trade adjustment assistance petitions accepted by the Labor Department because of job displacement from trade agreements between Jan. 1, 1994, and Jan. 1, 2001. In that period, about 757,000 petitions were certified. “We sought to be cautious and use a figure lower than 757,000, even though that figure covers only the first 7 years of NAFTA,” the USTR official said. But this is not really cautious but actually rather misleading. USTR is only counting job losses — and ignoring any possible job gains from the rise in U.S. exports to Mexico and Canada. The Commerce Department estimates that every $1 billion in exports in goods supports 5,300 jobs, which roughly translates into an additional 1.8 million jobs in the United States from the increase in trade with Mexico and Canada since 1994, even before calculating the impact from trade in services. As we have noted before, most mainstream economists do not believe the number of jobs is significantly affected by trade policy; instead, trade changes the mix of jobs. That obviously creates winners and losers, but Trump’s USTR is only focusing on the losers, which the official acknowledged. “The data reference was not an assessment of net gains or losses, but focused on the number of Americans who were certified by the Department of Labor as losing their jobs due to NAFTA,” the official said, adding that Lighthizer did note that “many Americans have benefited from NAFTA,” including in the agriculture and services sectors. The nonpartisan Congressional Research Service has closely examined NAFTA and concluded that “overall net effect of NAFTA on the U.S. economy has been relatively small.” The report noted that “U.S. trade with Mexico and Canada was already growing before NAFTA and it likely would have continued to do so without an agreement.” Moreover, it is difficult to isolate the actual impact of NAFTA from other economic factors that affect job creation and job loss. While Trump has railed about the U.S. trade deficit with Mexico in particular, CRS said that trade in crude oil and petroleum products distorts the deficit numbers. “If these products are excluded from the trade balance, the deficit with NAFTA partners has been lower than the overall deficit in some years. In some years, the balance in nonenergy merchandise has been positive,” CRS said. Lighthizer is especially skating on thin ice by calling this a “certified” figure, which appears to be an effort to attach some authoritative weight to it. Not only are the numbers 16 years old, but there are strong reasons to suspect they inflate the impact of NAFTA. The Wall Street Journal in 1997 reported that a survey of employers whose employees who had been “certified” as having lost their jobs because of NAFTA found many examples in which the trade deal played no role. The Labor Department was just bending over backward to award benefits to laid-off workers. A sawmill in Port Gamble, Wash., closed because its timber supply dwindled from efforts to save the spotted owl, so company officials were “dumbfounded” when the Labor Department certified every laid-off worker as a victim of NAFTA. “If anyone can find some legitimate connection to NAFTA in this, I’d sure like to see it,” a former manager said. The newspaper turned up numerous other examples of dubious “certified” claims, including 874 workers whose factory moved to Mexico in 1992, before NAFTA went into effect, because of competition from Japan. To recap, Lighthizer touted a statistic derived from fuzzy data that was 16 years old — and which ignored the positive impact of trade with Mexico and Canada. In doing so, he sidesteps the fact that most economists believe the impact of NAFTA on the U.S. economy was relatively modest and trade imbalances are relatively small, especially if oil products are excluded. His figure is offered without context and thus is rather misleading. 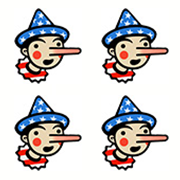 Lighthizer pushed this into Four-Pinocchio territory by stating such a misleading number was “certified” by the U.S. government and could well be “much, much bigger.” In doing so, he suggests this fanciful bit of spin was vetted by government experts. "The U.S. government has certified that at least 700,000 Americans have lost their jobs due to changing trade flows resulting from NAFTA."